For the fifth season of The Muppet Show, several episodes had overarching themes like “Alice in Wonderland” or pirates. 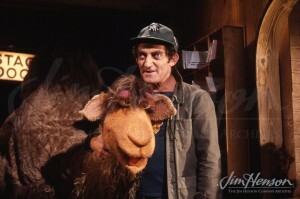 For Marty Feldman’s appearance, The Muppet Show players performed the stories of 1001 Arabian Nights. The hysterical and goofy Feldman played the parts of the Genie in Aladdin’s lamp, Scheherazade, the wife of an evil Caliph (as played by the Swedish Chef), and Wilbur and Orville Wright, a one man set of twins who tried to patent a flying carpet. He introduced himself with a Muppet camel named Sopwith in a nod to the WWI bi-plane favored by Snoopy. 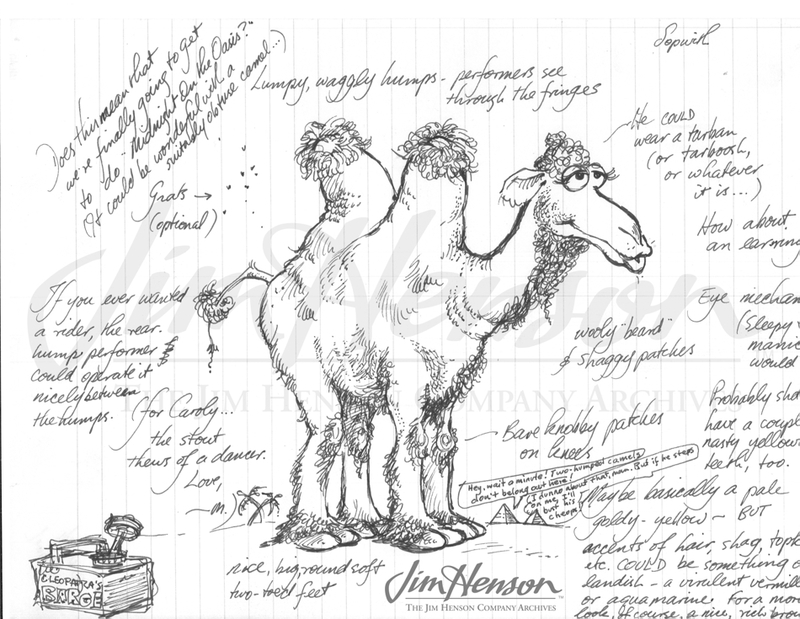 Given only petrol by Feldman rather than water, the camel blew engine exhaust from its mouth. The first themed sequence was the story of “Sinbad the Sailor,” with Kermit in the title role. He and his crew of frogs try to steal the treasure of an evil genie, as played by Sweetums, but with Kermit disguised as Sinbad the Surfer, the frogs launch into the Beach Boys classic, “Surfin’ USA.” Statler and Waldorf comment that it wasn’t Sinbad, “but it was certainly sung bad!” Other segments included Gonzo playing the part of Aladdin and wishing for a harem of chickens, Sam Eagle disapproving of Feldman backstage, and the song “Girlfriend of The Whirling Dervish,” complete with Muppets in turbans and a set with palm trees and a Middle Eastern city skyline. Later, when Fozzie and some bear gangsters tried to find “the loot” in the story of “Ali Baba and The 40 Thieves”, a cave is called open by shouting “open sesame,” at which point the Sesame Street Muppets all join The Muppet Show cast in singing the Sesame Street theme, and the closing number “Hot Time in The Old Town Tonight.” At the end of the show, Feldman noted that his favorite of the Muppet characters was Cookie Monster, who like him has a unique set of eyes. Feldman was born in London in 1934 and worked in the entertainment business from age fifteen. He toured in music halls, and wrote for BBC radio and television. This brought him to fame, and he went on to star in television shows and films such as The Frost Report, The Silent Movie, and Sherlock Holmes’ Smarter Brother. Feldman passed away in 1982, but he is still remembered for his most famous role as Igor in the Mel Brooks film, Young Frankenstein. Read about other Mel Brooks ensemble players Cloris Leachman and Dom Deluise on The Muppet Show. 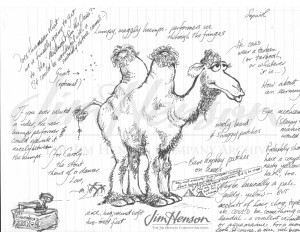 Camel design by Michael Frith with notes to builder Caroly Wilcox, 1980. Steve Whitmire performing “Girlfriend of The Whirling Dervish” on The Muppet Show with Richard Hunt looking on, 1980. Performing “Girlfriend of The Whirling Dervish” on The Muppet Show, 1980. Left to right: Louise Gold, Kathryn Mullen (hidden behind Hunt), Richard Hunt, and Steve Whitmire. Marty Feldman and a camel named Sopwith on The Muppet Show, 1980. This entry was posted in 07-July '80, 1980, Muppet Show and tagged Kermit, Marty Feldman, Swedish Chef, The Muppet Show. Bookmark the permalink.